Comparing a scroll saw to a table saw, is “like a Benz to a Chevrolet”. However, the intention here is not to show superiority as Big L did in his track, but to emphasize the difference between these tools. Can I start without having both of them? Which one is cheaper? Can the table saw substitute the scroll saw? I am pretty sure you have many questions, and I will try to answer most of them. However, before we reach to that, let’s start with an introduction, just to get to know both tools. A scroll saw is often believed to be the same as a jigsaw, but if you use that term you may be misunderstood since the original jigsaw is a handheld tool. The scroll saw is a tool fixed on a table. However, this is different from a table saw in many ways. The saw blade is 1/8’’ or even less than that, it is held from up and down and it is very efficient in making narrow cuts. Scroll saws are usually electric or pedal-operated. Why would someone want a pedal-operated machine? Well, mainly because it can be easier to cut that way, and it can be safer as well. On the other hand, we have the table saw. One of the rare similarities we have between these tools is that the table saw is again, a woodworking tool, but on this one, you have a circular saw blade attached on an arbor. The blade is powered by an electric motor. 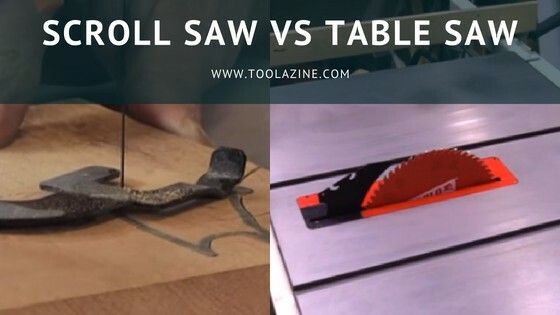 I guess most of you are familiar with the table saw and what this power tool is able to do, but in order to understand the differences between them, I would go even deeper and widen your knowledge. In next section, I will focus more on the details of both tools and will show you what can you use each one for. As I said, the scroll saw is a fixed, stationary machine designed for specific cuts. By “specific”, I refer to tasks that you cannot achieve with a table saw. So, what advantages does the scroll saw have over the table saw? First of all, it is very quiet. It does make noise, but that is several times less compared to the table saw. Plus, even though it produces dust, the dust you are about to get is minimal. And what can you use the scroll saw for? Now we’re asking real questions. The scroll saw is the best tool if your passion is making delicate cuts. It has a small blade, so it can go through tighter spaces and cut what other machines can’t. With this tool, you can create things like clocks, mini furniture, and name tags. If you combine several types of wood, you can try marquetry which may become your next main hobby. Using pieces of wood in different shapes and colors, you will be able to make patterns or even whole pictures. Believe it or not, this is the biggest reason why most people get a scroll saw – it is well paid and it becomes an addiction. But what about sanding? You will spend a huge amount of time cutting those small pieces, how to make them perfectly smooth? Fortunately, the pieces cut by a scroll saw, require little, or even no sanding at all, which we can’t say about the things you cut on a table saw. In addition to this, it is good to know that the scroll saw is good at cutting other materials apparat of wood, like pipes, plastic, or some metals. Another benefit of this tool is the variable speed – it has a knob that you can use for more efficient cutting. It is not rare making angle cuts, but the thing that will definitively catch your eye is the pierce cut. What kind of cut is a pierce cut? Many tiny ornaments will require specific cutting that doesn’t allow you to go from the outside of the wood piece, as that way you would destroy it and it won’t look good at all. You drill a small hole where you want to make the cut, and use the scroll saw to create a cut on the interior, without cutting from the outside. This type of cut is known as a pierce cut. For the end, the last, but not least important thing – safety. To make precise cuts, you need to hold the wood with both hands. And, if there is no one near you, who will start the machine? If you move one hand to use it, the piece might move as well, resulting in an unbalanced cut, or increased risk of injury. That is why you might want to choose a pedal-operated scroll saw, rather than the traditional, electric one. You can put both hands on the wood piece, and start the machine with your foot. Every tool needs to be handled in the right way and under proper conditions, as you don’t want to injure yourself or make any damage. The scroll saw is probably the safest tool for woodworking you will ever find. If you have a small kid and he is always around you and you seem like woodworking could be joyful for him/her, this machine is the first on the list. However, if you decide on a step like that, make sure your teaching skills are good, and you should always monitor every single move it makes. If you need more information on how, and why to buy yourself a scroll saw, take a look at this video. As you may have noticed, a scroll saw is a great tool which is easy to use. But can it replace a table saw? A table saw is one of the most basic tools in woodworking. A table saw is also a fixed machine, although there are portable models as well. If you don’t have nerves for small cuts and you prefer working in construction, designing furniture and building stuff like that, a table saw is the most valuable asset you can get. It is a very noisy machine, and it produces a lot of dust. However, a table saw is a must-have. What can you do with a table saw? In general, you can perform two types of cuts – rip cuts and crosscuts. Rip cutting is basically cutting the wood by width, while crosscutting means cutting it by length. If you need more info about both cuts, how to perform them and which one is tougher, take a look at the rip-cut vs crosscut. What is the main use of a table saw? Generally, you will use it to cut blocks or panels of wood, like rectangular boards. Flat panels have a wide range of use, especially if your main focus is furniture. Plus, you can cut logs into smaller pieces, in order to fit in the fireplace. In addition to this, carving is another activity you can hardly perform without a table saw. A lot of tasks require wood cut by a specific angle, which can be done with a table saw as well. You are not limited to wood as well, as you can cut plastic and many metals with it. There is a lot more that you can do with a table saw. But, in order not to repeat myself, for other uses of this machine I suggest to read about what you can do with a table saw. When we talk about table saw, safety is something you really need to pay attention to. If you are unfocused on the task for a moment, you can make a fatal injury. You need to be concentrated and position yourself really good before you start cutting. Unlike the scroll saw, you need experience and knowledge before you can start cutting. Before taking the wood in your hands, I would recommend taking a look at the woodworking basics that will guide you to make precise cuts, with maximum safety. Apart from the standard safety gear, using a table saw requires a crosscut sled. What is a crosscut sled, how to use it and how to build one – you can find more info about it here crosscut sled for jobsite table saw. Since the market is full of machines, finding the right model could be time-consuming. In order to help you with that, I found several great-quality models in different price categories. You have a limited budget, but your desire to start making ornaments is huge? No problem. This model will give you full control over your designs and your creativity. You can choose to go from 550 to 1600 strokes in a minute, depending on the task. Unlike many models, this scroll saw can cut in two directions and the 9/16” stroke saw can cut wood up to 2” thick. I know it sounds unbelievable, but you get a 2-year warranty as well. Check the latest price for the WEN 3920 Scroll Saw Here on Amazon. Again, a great model that you need to consider – perfect for beginners. Using the SKIL 3335-07, you can make whatever you like, as this machine has the potential of the smallest cuts you can imagine, at different angles. You can easily set your saw to a different speed, and with the 16” throat cutting thicker pieces of wood is like cutting butter. You can check the current price of SKIL 3335-07 Scroll Saw here on Amazon. No matter if this is your hobby or profession, once you start using a scroll saw you will understand the importance of the precision. And precision is DEWALT’s middle name – this model is best known for the extremely accurate cuts, no vibration or noise. Just like other scroll saw, it has variable speed control, LED light and dust blower, but it can offer something others can’t. If your budget allows you, don’t hesitate and go for it. Check the current price for the DEWALT DW788 Scroll Saw here on Amazon. If you are too lazy to build a table saw, and your budget doesn’t allow you to spend much money for one, consider this one. It is great for hobby or craft, so pictures frames, molding or plastic can be done with ease. It is very convenient to use and it offers maximum protection. Home or workshop use, this model definitively deserves your attention. You can check the price for Goplus Mini Electric Table Saw here on Amazon. Most of the saws you can get in this price range are portable. They are quality models, and even though they are not for professionals, they can do what a typical DIYer requires. The Craftsman Evolv is a lightweight table saw, and you can adjust the rip fence and miter gauge in order to get an accurate cut. Like what you read? Continue to the full review of the Craftsman Evolv which is considered the best table saw under $200. In case you like it, you can check its latest price here on Amazon. Another model form DEWALT – this one with a 10” blade and 32.5 ” rip capacity, perfect for homeowners and workshops. It is good to mention that this is a portable saw, that can be easily transported and adjusted with only one hand. It is made from aluminum, so you can easily transport this small table saw. If your budget allows you, go for this one, you won’t regret it. If you need more info about it, check the full review of the DEWALT DWE7491RS Table Saw which is considered the best table saw under $600. In case you already decided to buy it, you can check its current price here on Amazon. This is a very tough question, and in order to answer it, you need to know what do you want to do with the machine. If tiny cuts and marquetry are your passion, there is no doubt that a scroll saw is what you need. However, if you want to build furniture, your first step should be getting a table saw, as it is the best pick for big jobs. The best thing you can do is to get them both – cut the wood with the table saw into smaller pieces, and the use the scroll saw to make delicate cuts. Define your budget, find the right models and start working. If you are looking for a table saw with more power check out my review of the best cheap cabinet table saw. Which one do you prefer? What is your opinion on this topic? Please share this and leave a comment. I bought a table saw first and it took me some time to get comfortable working with it. For a beginner, it can be pretty scary. I learn two things that saved my fingers a few times- lean on the table with one hip for better stability and if anything goes wrong, keep your hands to yourself. After you get comfortable around it, a table saw is a brilliant tool.